I’ve written about how amazing Mr. Clean Magic Erasers are before. Following are a few more first-hand examples of how the Magic Erasers have made our home and other products look like new again! Remember, I use scissors to cut one whole Magic Eraser into about 8 or 9 smaller Erasers first. The Mr. Clean Magic Erasers site itself lists many unique uses for these handy dandy little lo-tech gadgets. But I figure others might appreciate hearing firsthand about the effectiveness of Magic Erasers, along with an explanation regarding just how well they work. This was listed as a common use for Magic Erasers, but I hadn’t tried it myself until recently. Yep, these little white wonders removed 100% of the soot from the inside (and outside) of my Yankee Candle glass jars! So now it looks pretty sitting on my countertop again, rather than stained with black soot. There’s no scrubbing necessary… just keep rinsing out the Eraser after each swipe of the soot. I tried soap & water, Windex, and a few other things, but the same old water ring type stain remained in several places on our windowsills. Last weekend, I decided to try the Magic Eraser on it, and wa-lah… all our windowsills look like new again! We’ve lived in our home for 5 years now, and this is the first summer we’ve noticed the green grime on our gutters, and on some of our porch columns (the sides that face the sun). We’ve also got a bit of it starting to appear on some of the vinyl siding. I know that a pressure washer would probably rid our home of the green grime, but as an experiment, I wanted to try the Magic Eraser first. It worked effortlessly on the porch columns… Removed all of the green slime in seconds! Too bad they don’t make Magic Erasers big enough to tackle an entire side of the house with vinyl siding that’s green & mossy. On a related note, the Magic Erasers work just as well on the dried-up bug guts that have accumulated on each of our front porch pillars. We probably have more of a build-up than most other homeowners because we leave the front porch light on all through the night. That light tends to attract bugs of all kinds — flying bugs, biting insects, spiders, and everything in between. But no need to worry, the Magic Erasers made our columns look like new again — sparkling bright white — in a matter of minutes! On a related note: While I’m tempted to do this myself, I don’t think you should use Magic Erasers to remove dead bugs from the front of your car. I’m pretty sure these Erasers will damage a car’s paint. I have a glass cooktop. I’ve always used those special cleaners for glass cooktops. In fact, a friend of mine warned me years ago that his cooktop started “chipping” or “fading” after awhile (he thought it was due to scratching the pots & pans across the glass top), so I’ve always been extra careful with ours. But the day I saw my mom using a razor blade to scrape burned-on food from her new glass stove top, I had to jump in and say, “Mom… Stop!” Perhaps the newer stovetops are built differently these days, and perhaps a razor blade won’t hurt a thing, but I wouldn’t take the chance. Then I thought about Magic Erasers. Wa-lah… they work MAGIC on burned-on stove stuff (…and dried-on grease & splatters from deep-frying too). My hubby works with cars, car parts, and greasy guys. Recently, some of the crew guys got in our car and left a bunch of black tar spots, grease streaks, and ink pen stains on the doors and dashboard inside the vehicle. Magic Erasers to the rescue! In no time, one tiny sliver of a Magic Eraser had removed every bit of the black stuff… and the ink pen marks, too! I don’t know about those rubbery seals on the inside of your dishwasher and refrigerator or freezer… but mine tend to get loaded with black gunky stuff. My refrigerator door seal even looked moldy in some spots. I took a magic eraser to them, and in seconds, all the gunk was removed and they sparkled white again! It wasn’t until we got our new Harley Davidson motorcycle that we saw firsthand just how well Magic Erasers work on whitewalls! Jim uses them every single time he washes the bike. And lots of our fellow motorcycle riders swear by them too. Jim still likes to use a product called Bleche White as a finishing touch. But he uses a Magic Eraser first to thoroughly clean the rough textured whitewalls themselves. TIP: A motorcycle friend of ours had been using straight bleach on the whitewalls of his brand new Harley, and they are now tinted yellow instead of bright white like ours. (This after only a few months of use!) I can attest to the fact that our whitewalls have not yellowed or dried out in any way after using Magic Erasers. We recently moved into a new home and decided to rent our former home. Now that we’re landlords, I’ve been using Magic Erasers more than ever! We’ve been extremely lucky to have great renters who try hard to keep the place neat and clean, but trust me when I say even the cleanest of tenants can’t do much to keep white walls free from scuff marks, dirty hand prints, pet sneezes, and the like. When we are cleaning the house in between renters, I buy a huge supply of generic Magic Erasers at Walgreens and/or Home Depot and use them for all the touch-ups in our rental home — from the kitchen to the bedrooms. They work so well on the walls, it’s similar to doing paint touch-ups… but much cheaper and quicker! On a related note, in our new home we have tan colored walls that the original owner painted with a matte paint (ugh!). Not only do the Magic Erasers work great on corners where people naturally grab or rub as they walk by, but I’ve also found that they remove soda splashes from the wall — without being noticeable or harming the paint job. My newest use for Magic Erasers is to remove marker stains from Dry Erase boards. Have you ever left notes on a Dry Erase board so long that when you tried to erase it, it wouldn’t come off? Or if it did, it left a lightly colored version of those words on the white board. This happens all the time with my husband’s “To Do list” which he keeps on a Dry Erase board. He often neglects to erase those tasks he’s done, and just draws a line through them instead. A Magic Eraser removes all traces of the ink! TIP: Don’t go crazy rubbing in all directions all over the board. Just lightly rub the places where the ink is set in. Otherwise, your white board may not last quite as long or function quite as well due to the mini scratches that can result from overuse. You know those hand-press lemon and lime squeezers? I have this yellow lemon squeezer and I use it all the time to squeeze half a lemon at a time — into a glass of water (to make healthy lemon water), or into a recipe (for fresh lemon juice). But, due to the sprays they use on fresh produce these days, there’s a gunky residue that stays behind in the lemon squeezer after each use. Good news: I just discovered that the Magic Eraser works its magic once again by completely removing that buildup inside a lemon squeezer! In case you’re wondering are melamine sponges safe? 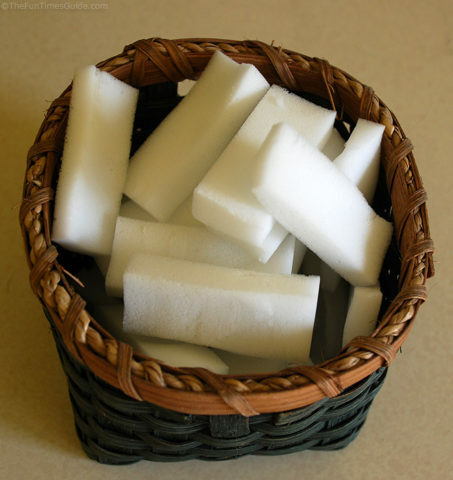 And how does a melamine sponge work?… Here are the facts about melamine foam sponges.